Cedric Soares to Inter Milan built on Thursday, and ended the day considered a done deal which would be confirmed by a Friday medical. 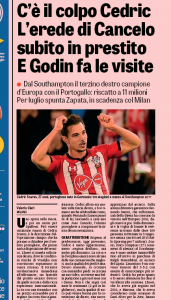 Portuguese newspaper A Bola first had claims in their Thursday edition, saying Southampton had reached a pre-agreement with Inter for a €20m transfer. That seemed reasonable for all concerned. Then it was reported as a loan deal plus an option to purchase, which wasn’t first disclosed, with an initial payment of just €1m. Things were slipping, but if it ended up with the Saints getting €20m in the summer, it wouldn’t be so bad. Now Gazzetta dello Sport report the initial payment is actually less than €1m, and the option, not obligation, to purchase is at €10-11m. The Italian newspaper point out this gives all the power to Inter and should they want to give up on the 27 year old in a month or so, and send him back in the summer, it’s no big deal. It’s worth noting this is what is happening with Šime Vrsaljko, another right back. He was loaned from Atletico Madrid for the season with a €17.5m buying clause. He had a few injury problems in September but has mainly been available since, making thirteen appearances. That’s not to forget another right back, Danilo D’Ambrosio, who has made 19 appearances and has spoken recently about expecting a renewal. For Inter, Cedric is a gamble which could pay off and make the €10-11m look even smaller than it does right now. If not, no biggie for them. There was surely a better deal somewhere for Southampton.